Blue Dog Gabby Giffords represents Arizona's 8th congressional district, which includes much of Tucson, outside the largely Latino west side, which is part of on Raúl Grijalva's 7th CD. She won the seat in 2006, after openly gay, moderate Republican Jim Kolbe retired and a bitter Republican primary yielded up far right sociopath Randy Graf. She won with 54% of the vote and two years later increased her margin to 56% when the GOP ran state Senate president Tim Bee, a more mainstream candidate, even as John McCain won the district in the presidential race. Giffords joined both of the conservative Democratic caucuses when she entered the House, the Blue Dogs and the New Dems. Although not as far to the right as either Ann Kirkpatrick or Harry Mitchell, she is among the most consistent aisle crossers among Democrats with a worse voting record than even villains like Allen Boyd (Blue Dog-FL), Jim Cooper (Blue Dog-TN), Melissa Bean (IL) and new comers who have gone over to the Dark Side like Larry Kissell (NC) and Suzanne Kosmas (FL). As of June 30, FEC records show she's raised $2,273,221 for the 2010 campaign. She's taken in more than twice as much from business PACs than from Labor and this morning's CQPolitics reports a tough, nasty race shaping up, although not for November but between two GOP kooks seeking their party's nomination to challenge her, Jonathan Paton, a relatively mainstream conservative, and Jesse Kelly, an out-and-out Glenn Beck teabagging imbecile who has been endorsed by a gaggle of far right congressional xenophobes like Trent Franks, Marsha Blackburn, and Duncan Hunter (father and son) as well as the Family Research Council and most of the tea party and militia groups operating in the area. Republican state Senator Frank Antenori sums up the primary like this: "Whichever one wins, they need to go after her. They can’t pussyfoot around her. Paton has more experience and because of that is more methodical. Kelly is just a brawler, and a lot of people just want to see him get through the primary so he can slap her around in the debate." Make you want to rally to Giffords' banner? Not so fast. Take a look at the new video Giffords is running in Tucson, a media market she shares with on Raúl Grijalva, chairman of the Congressional Progressive Caucus, someone who has always supported her politically despite her very conservative stance on issues. Giffords is looking like the point of the Blue Dog spear being thrust into the House progressive infrastructure. As we pointed out over the weekend, despite Pelosi's efforts to tamp it down, the Blue Dogs are going on the warpath against progressive Democrats, using Henry Waxman's interview with The Hill as an excuse. One thing we can always be sure of inside the Democratic Caucus-- well, two, actually: Blue Dogs will always put self-preservation above the party’s principles, and the DCCC will do whatever it can to help them get re-elected. Giffords is emblematic of the tragic turn the House Democratic Party has taken. Over the weekend she launched a $350,000 ad buy in the Tucson media market that slams the principled stand Grijalva took against SB1070-- throwing him directly under the bus in order to make herself look sufficiently xenophobic for the bloodthirsty Know Nothing mobs. As you can see in the ad, she makes a solemn vow to fight “these groups” who have protested this unjust law by boycotting the state. “These groups” include Latinos, liberals, and citizens across the country who know an injustice when they see one. She's directly targeting Grijalva, Arizona's most progressive leader and the Congressman who most consistently stands up for those who are hurt by the right wing’s agenda. We hear that other campaigns, pollsters, donors and politicians joined Grijalva's staff in futile attempts to show Giffords the obvious-- Democrats using other Democrats as punching bags is bad news for everyone. And when DCCC leaders, such as Vice Chair Wasserman Schultz, were approached with the argument that Giffords should not run the ad for obvious reasons, the argument fell on deaf ears. (Instead, they’re rewarding her behavior with close to a million dollars in independent expenditures.) It’s bad enough when so-called Democrats habitually vote against our agenda to save their seats, often with DCCC prompting. Now they're spending Democratic money to hurt real Democrats to save their seats. During her time in Congress, Giffords has had multiple opportunities to stand up for and move reform forward, but, fearing political attacks in an election year, she has chosen not to. She often tells her colleagues that she "had to vote against her principles" because she needed to position herself to get reelected. Funny, because when she ran in 2006 she indicated that comprehensive reform was a moral obligation. Giffords actions involve an unspoken accommodation of SB1070. Her constant calls for more troops on the border are poor cover for her lack of political courage to push for deeper, meaningful improvements to our immigration system. Her silence does her no credit when politicians like Brewer, McCain and Pearce make outrageous statements about beheadings, border shootouts and constant kidnappings-- statements fabricated to appeal to people’s insecurities rather than to common sense and rational debate. When Grijalva took a leadership role in speaking out against SB1070 and called for civic, political and religious organizations not to bring their conventions and conferences to Arizona, it was a defining and courageous political stand. Since then, he has said that economic consequences mean nothing to political ideologues, and he has been actively working with industries to bring business back to the state to help amplify his voice and effect change (www.vivaarizona.org is one such example). Giffords’ attack on his stand and on everyone who joined him in fighting for what is right obfuscates her failure to exhibit meaningful leadership in this fight, and hurts those who did. Raúl needs help fighting back, and Blue America is asking supporters to donate to the OneAmerica page so he has the funds necessary to defend himself. Minutes before publishing time I reached Raúl in Tucson and I was surprised to find him in such a determined mood. "I kind of feel like a character in the movie The Expendables, he told me. "In an effort to maintain their presence in Congress, Blue Dogs are throwing progressives under the bus. I find it disheartening and, quite frankly, I am embarrassed as a Democrat. 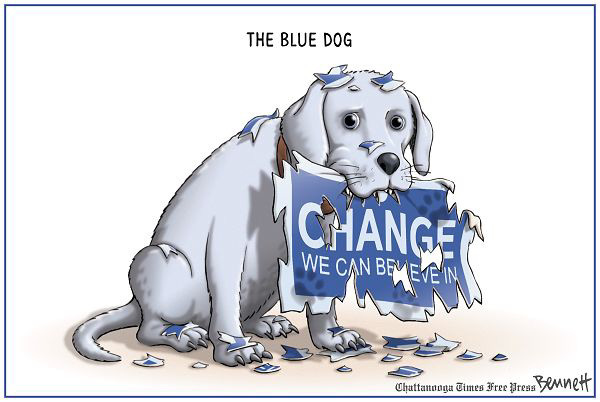 In their effort to be Republicans, Blue Dogs often paint progressives as expendable. They're going to find out that we definitely are not." Although Giffords is trying to portray herself as a victim and attempting to raise money for herself on this Grijalva wrote a diary at Daily Kos about the immigration situation in Arizona and how Giffords is using it against him. Gabby says that she will stand up for Arizona and fight any group that will hurt Arizona. Raul now agrees that a boycott is ineffective against ideologues. I just wish he had thought about that before he called for a boycott. I agree that they have been effective in civil rights protests and have been a determining factor in achieving justice. However what Raul misjudged is that Brewer, McCain, Kyl, Antenori and Pierce DON"T care about Arizona's economy or Arizonans. Gabby does care and she has been outspoken in Washington and in Cochise County. Of the D's in tough districts, she was the only one who voted for all of the 10 key Dem votes in 2009 (for Health Care Reform, against Stupak amendment, Ledbetter Fair Pay, Wall Street Reform, etc) http://www.fivethirtyeight.com/2009/12/2009s-most-valuable-democrat-is.html. We're Democrats. As such we should be accepting of differing views on difficult problems. Disagreeing is NOT attacking. We don't have to all walk in lock step to get down the same road. Lets leave that kind of rigidity to the republicans. We have the REAL big tent.